In order to uphold our promise to meet or exceed the minimum standard of dental care set forth by the American Dental Association, we recommend patients attend dental checkups at our office two times each year. 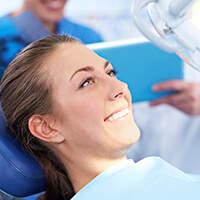 At every dental checkup, we examine your oral and facial tissues and structures screening for signs of oral cancer, periodontal disease, and other common oral health issues. Then, we complete a careful tooth by tooth examination, assessing weakened areas, looking for signs of decay, and checking all existing restorations. If we discover any of your restorations are damaged or you’d like to exchange a metal or amalgam restoration for a tooth-colored alternative, we’d be happy to do so on the day of your exam. Contact us to schedule your six month checkup today. In most cases, these regular checkups give us plenty of time to intercede at the earliest stages of oral health issues. We prevent the majority of potential tooth decay or damage, and we’re able to diagnose other concerns in the earliest possible stage. That means patients receive conservative treatment and avoid the pain and cost of more extensive restorative services.